We are glad to share with you that book review by our senior contributor Jiten Upadhyay for “Keepers of the Kalachakra” by Aswhin Sanghi is published in the November 2018 issue of “Pune Trends”. 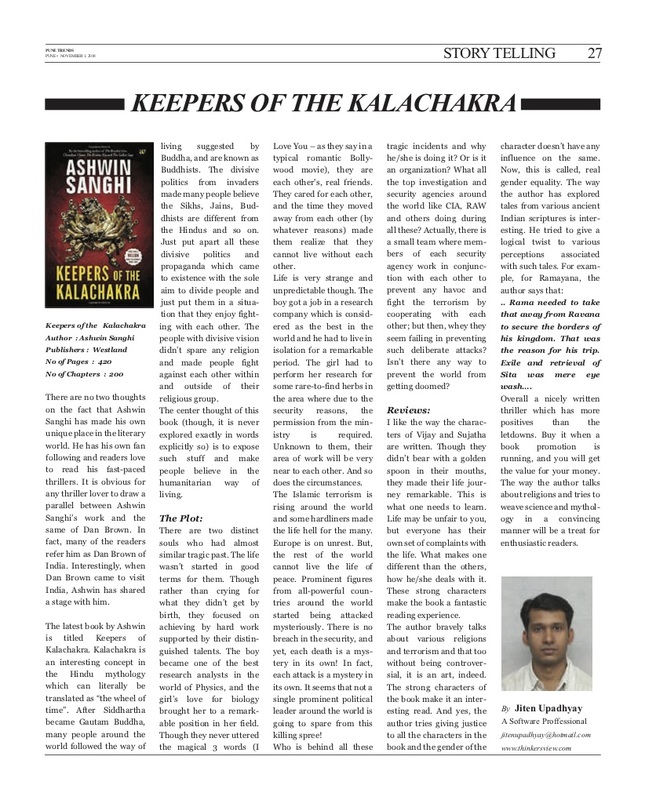 Published in “Pune Trends”, Review article for – Keepers Of Kalachakra, a book by Author Ashwin Sanghi, by our senior editor – Jiten Upadhyay. There are no two thoughts on the fact that Ashwin Sanghi has made his own unique place in the literary world. He has his own fan following and readers love to read his fast-paced thrillers. It is obvious for any thriller lover to draw a parallel between Ashwin Sanghi’s work and the same of Dan Brown. In fact, many of the readers refer him as Dan Brown of India. Interestingly, when Dan Brown came to visit India, Ashwin has shared the stage with him. The latest book by Ashwin is titled Keepers of Kalachakra. Kalachakra is an interesting concept in the Hindu mythology which can literally be translated as “the wheel of time”. After Siddhartha became Gautam Buddha, many people around the world followed the way of living suggested by Buddha, and are known as Buddhists. The divisive politics from invaders made many people believe the Sikhs, Jains, Buddhists are different than the Hindus and so on. Just put apart all these divisive politics and propaganda which came to existence with the sole aim to divide people and just put them in a situation that they enjoy fighting with each other. The people with divisive vision didn’t spare any religion and made people fight against each other within and outside of their religious group. There are two distinct souls who had almost similar tragic past. The life wasn’t started in good terms for them. Though rather than crying for what they didn’t get by birth, they focused on achieving by hard work supported by their distinguished talents. The boy became one of the best research analysts in the world of Physics, and the girl’s love for biology brought her to a remarkable position in her field. Though they never uttered the magical 3 words (I Love You – as they say in a typical romantic Bollywood movie), they are each other’s real friends. They cared for each other, and the time they moved away from each other (by whatever reasons) made them realize that they cannot live without each other. Life is very strange and unpredictable though. The boy got a job in a research company which is considered as the best in the world and he had to live in isolation for a remarkable period. The girl had to perform her research for some rare-to-find herbs in the area where due to the security reasons, the permission from the ministry is required. Unknown to them, their area of work will be very near to each other. And so does the circumstances. The Islamic terrorism is rising around the world and some hardliners made the life hell for the many. Europe is on unrest. But, the rest of the world cannot live the life of peace. Prominent figures from all-powerful countries around the world started being attacked mysteriously. There is no breach in the security, and yet, each death is a mystery in its own! In fact, each attack is a mystery in its own. It seems that not a single prominent political leader around the world is going to spare from this killing spree! Who is behind all these tragic incidents and why he/she is doing it? Or is it an organization? What all the top investigation and security agencies around the world like CIA, RAW and others doing during all these? Actually, there is a small team where members of each security agency work in conjunction with each other to prevent any havoc and fight the terrorism by cooperating with each other; but then, whey they seem failing in preventing such deliberate attacks? Isn’t there any way to prevent the world from getting doomed? I like the way the characters of Vijay and Sujatha are written. Though they hadn’t born with a golden spoon in their mouths, they made their life journey remarkable. This is what one needs to learn. Life may be unfair to you, but everyone has their own set of complaints with the life. What makes one different than the others, how he/she deals with it. These strong characters make the book a fantastic reading experience. The author bravely talks about various religions and terrorism and that too without being controversial, it is an art, indeed. The strong characters of the book make it an interesting read. And yes, the author tries giving justice to all the characters in the book and the gender of the character doesn’t have any influence on the same. Now, this is called, real gender equality. .. Rama needed to take that away from Ravana to secure the borders of his kingdom. That was the reason for his trip. Exile and retrieval of Sita was mere eye wash…. Overall a nicely written thriller which has more positives than the letdowns. Buy it when a book promotion is running, and you will get the value for your money. The way the author talks about religions and tries to weave science and mythology in a convincing manner will be a treat for enthusiastic readers.